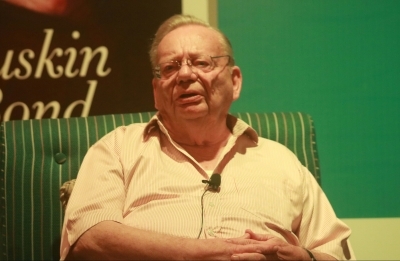 New Delhi, Oct 29 (IANS) Author Ruskin Bond, who has been enthralling readers for 60 long years with over a hundred novellas, short story collections, non-fiction and poetry books, thinks that he has survived as a writer by being a being a practical person. “When I write, I do it for myself. I just enjoy the business of writing any story or trying to please the imaginary reader who might be an extension of my own personality,” Bond said at the Penguin Fever, an event organised by the Penguin Random House India to mark its 30th year in publishing, held at the India Habitat Centre here on Sunday. The 83-year-old author, who now lives in Uttarakhand’s Landour, believes his writing can be enjoyed by people aged between six to 60. “I am a compulsive writer and even at times when my writings weren’t getting published very much, I continued writing because it was just a natural thing to do,” Bond said. The author who has been conferred the Sahitya Akademi Award, Padma Shri and Padma Bhushan, went on to talk about moments he was left disappointed or discouraged when his books did not do well. But that did not stop him from writing. “I never wanted to give up writing because I knew that would have been fatal. Once you give up, it is very difficult to start again. If you have confidence in yourself you must not give up. Never despair and if you despair, work on in despair,” he added. Asked whether he ever considered becoming a football player, something he loved in his younger days, Bond said that his decision of becoming an author has been the right one. “I think I did the wise thing by sticking to writing because here I am in my 80s still writing stories, whereas it wouldn’t have been possible for me to run after a football at this age. “There’s always something on my writing desk, be it an essay, short story or may be another memoir. I am like a grasshopper, jumping from one story to the another,” Bond chuckled. The author, whose autobiography “Lone Fox Dancing” was released earlier this year, said that he is ready with another book titled “Till The Clouds Rolled By” a sequel of his earlier book “Looking For The Rainbow”. “Till The Clouds Rolled By”, which talks about his days in Delhi and his mother and step father, will be released next month.